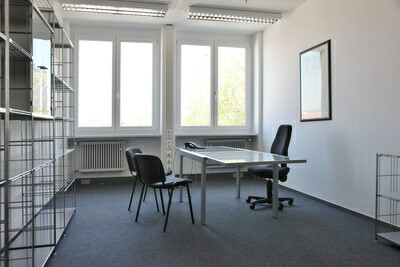 From the business idea to the business plan: Furnished office, internet access (excl. PC), central copier and network printer, free use of the conference room, exchange of experience with other in-house companies and synergies. Potential founders can apply for this fully furnished office here. This low-cost offer is valid for the start-up preparation period and is limited to three months. We support those wishing to start a business in the preliminary start-up phase by providing infrastructure, information material on start-up concepts, a business plan, contacts with authorities, sponsors, consulting services, etc. You only pay extra for telephone and fax connections, copy work, postage etc. Valid for the preliminary start-up phase, max. 3 months. Our region may not be Berlin for start-up purposes, but Ulm and its surrounding area also have a great start-up community, supported by really cool people. And we're right in the middle of it, helping you to access it. Be it access to committed like-minded people, potential business partners, to Start-up BBQs or to new, exciting projects such as “weinhof9”, the experimental field for the world of tomorrow. A business initiative will help you, as well as local associations and clubs. Use our connections and help to build up and expand the local start-up community. You are very welcome! As a founder himself, Manuel Fink coaches and supports start-ups in and around Ulm. His strengths lie in business model and product innovation, lean start-up, growth marketing and the design and development of scalable web applications. His focus is on customer-centric solutions and scalable customer access. His foundation serves to support municipalities, associations, companies and organisations in the publication of print magazines and cross-media digital publications. His editorial system and publishing automation serve to digitize, integrate and automate the associated processes. In his free time, he is a passionate climber and mountaineer and a volunteer at the Alpine Club. Since 2015, I have been working on the idea of using an App to connect people who have met in everyday life. And since 2016, this is why I have been renting a start-up office at the TFU, which enables me to realise my project and supports me with in-house advice and synergies. My project covers sensor technology and medical therapy. The question is: How does one link these two fields? As a physiotherapist, you are confronted with problems during therapy that cannot be solved by humans alone. This is why technology must be used in conjunction with therapy and therefore serve to train the user. Juliane Wessalowski is the organiser and mentor of the project “Jugend hackt” [Young Hackers]. At the University of Ulm, she spent five years promoting young talent and conducting programming workshops for the Hector Children's Academy, the “Stadtjugendring” and Girls Day. She is currently continuing these activities at the “Verschwörhaus Ulm”. She is also active at the Open Knowledge Lab Ulm in the field of Open Data. Juka is committed to promoting young talent in computer science, gender equality, human rights and Open Data. In 2015 she organized the first “Jugend hackt Süd” in Ulm and is a mentor in Berlin. It only has a future if it is being read. This is the motto under which we develop our professional and special interest media and services for clearly defined target groups. The core of our service is first-class information for our readers and users. The various regional activities around Open Data, Open Government, Free Knowledge and Free Software are bundled in this “House of Free Knowledge”. With 3D printers, tools, electronic workstations and much more, the “Verschwörhaus” has everything you need for modern youth media education - but also for prototype construction for the next great world-shattering invention! Stefan Kaufmann is co-founder of the Ulm-based datalove group, one of the oldest still active open-data working groups in Germany. He wrote his dissertation in 2014 on Open Data in the German public transport system, after which he worked as a consultant for Deutsche Bahn AG with regard to its data transparency. In June 2016, he was commissioned by the city of Ulm to set up the “Verschwörhaus”. The Ulm Start-up BBQ is a casual platform for founders and those interesting in founding their own start-ups from the Ulm and Neu-Ulm region. The Ulm Start-up BBQ has been held since 2015 and was initiated by Unternehmensberatung Gru&F in Ulm. The Ulm Start-up BBQ is very popular among the start-up communities of Ulm and Neu-Ulm. The number of participants, including new ones, is accordingly high. As one of the large centres, we work across national borders and offer you tailored facilities and laboratory space at four different sites. This is the place for great companies and even greater people. See for yourself. Perhaps your next cooperation partner is already here? As a start, some describe what drives them and how they are progressing or how they have already become successful. Exchanging ideas and mutual support benefits everyone.